One of the things I enjoy most about browsing through antique fairs, flea markets, and trade days is spotting craft ideas. 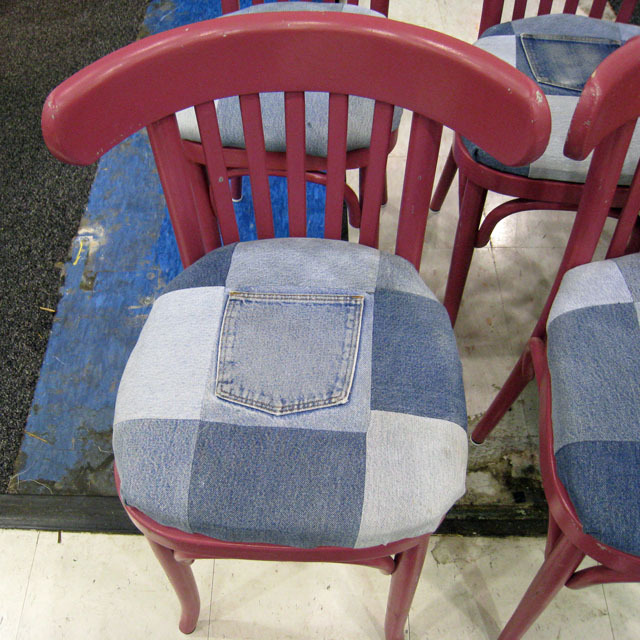 Often these ideas involve upcycling - converting useless or no longer wanted items into something new and/or useful. 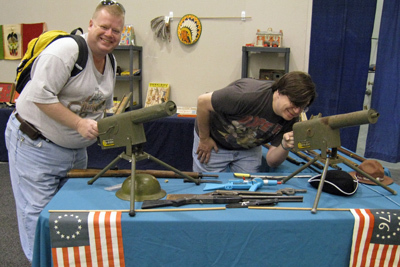 Here are a few examples from our recent trip to a local antiques market. 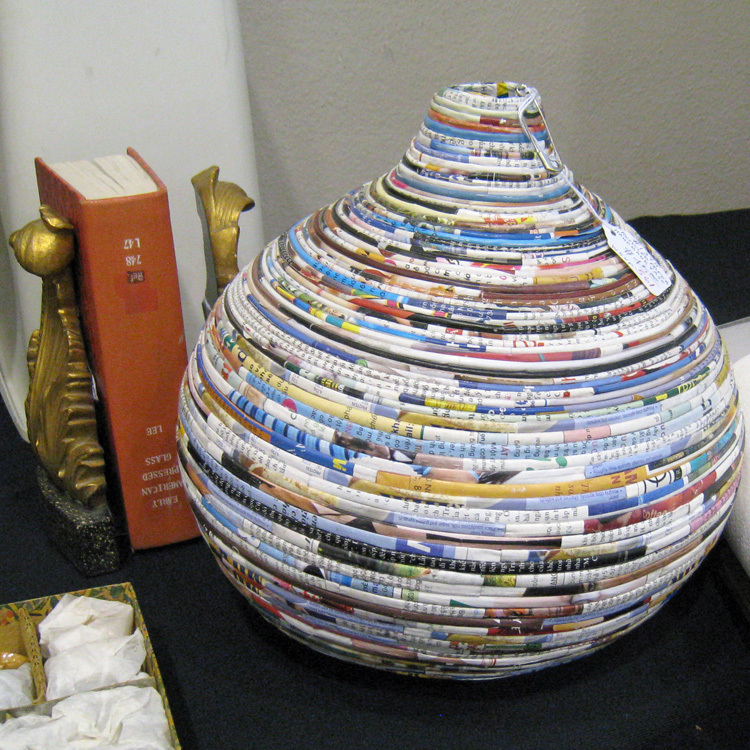 This vase is made from tightly rolled magazine pages. I've seen a similar technique used to decorate picture frames as well. 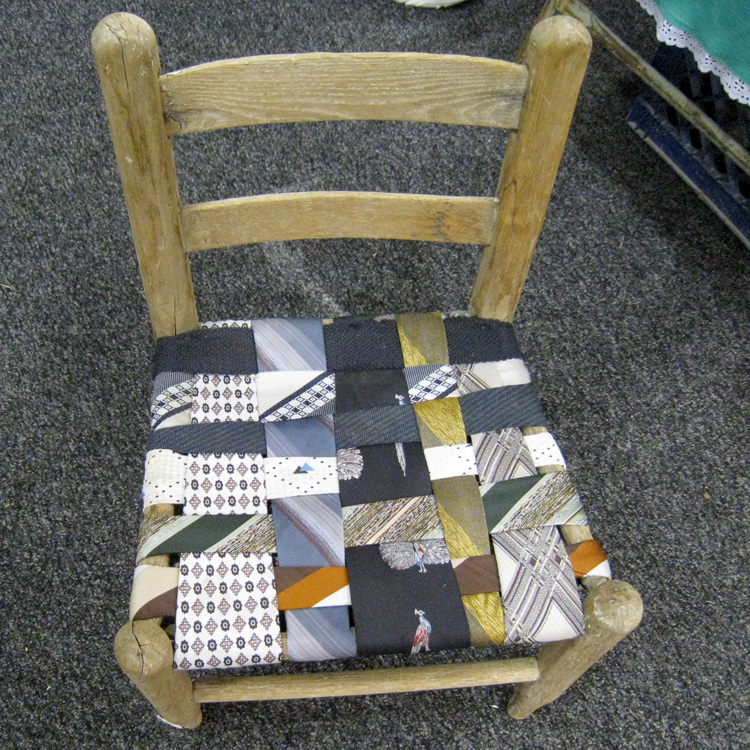 This chair was given a new seat using men's ties plaited together. Underneath the ends of the ties are simply knotted together. 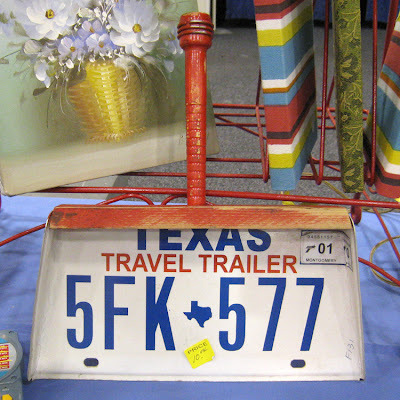 An old Texas license plate has been turned into a dust pan with a few bends & the addition of a handle. And finally, a sailboat art decor piece made from aluminum cans. 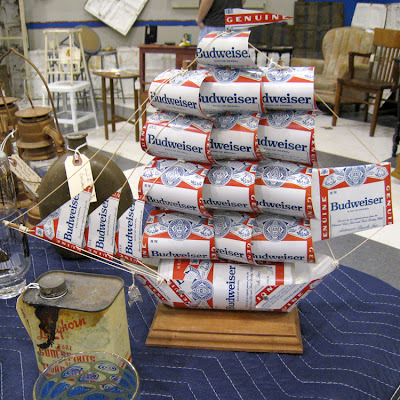 Of course, if I were to try this, it would have to be fashioned out of Coca-Cola cans! In the spirit of upcycling, I'm starting the new Lift Me Up workshop at BPC today. The class is four weeks long and provides inspiration and instructions for four creative upcycling projects. Anyone else taking this class? 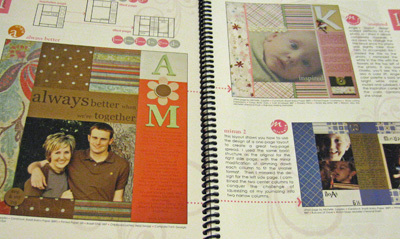 Sounds a great book - I've been doing a lot of scraplifting recently - I decided I wanted to try some different styles so last week I noted down several LO I liked that were is very different style to my norm and I've been playing with first doing an exact placement copy and then moving things around - all so easy to do in digi. 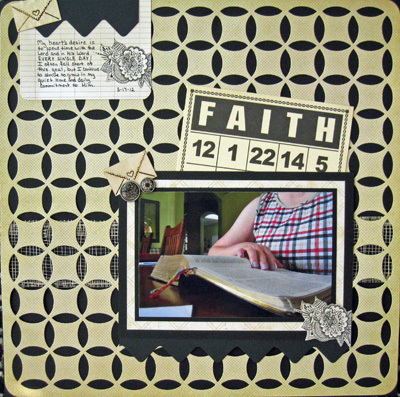 More and more over the past year, I have been incorporating layouts about my faith into my scrapbooks. I love how this important aspect of my life is now represented in with all our stories. Here are my two most recent layouts. 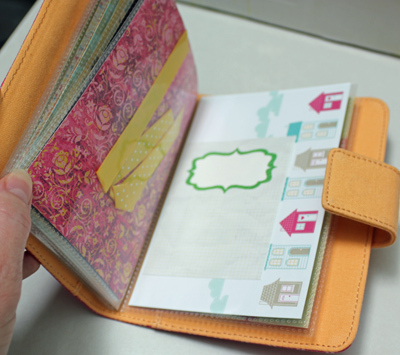 I used sketch #10 from the BPC 28 Sketches and this great die cut paper as the starting point for this layout. Journaling reads: My heart's desire is to spend time with the Lord and in His Word EVERY SINGLE DAY! I often fall short of this goal, but I continue to strive to growin my quiet time and daily commitment to Him. This next layout has actually been in the works for a couple of years. 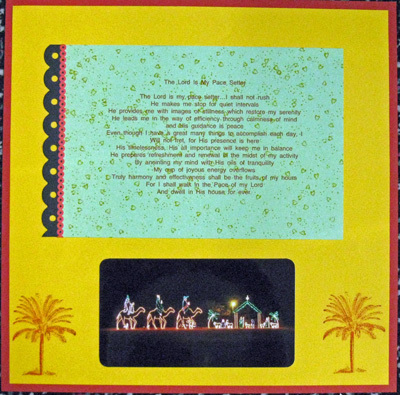 I printed the poem, adhered it to the yellow background, then added the heart and palm trees stamps several years ago at a Bible study meeting. I wasn't sure what I wanted to do with it, so it's been sitting in my themed paper file all this time. As I was flipping through my storage binders recently, the photo of the nativity scene caught my eye, and I decided it was time to complete this page. And dwell in His house for ever. I had fun using the Twelve Photos prompts to capture images on our recent visit to Southfork Ranch. In fact, I had so much fun that the true challenge was deciding which twelve photos to share today! 1. 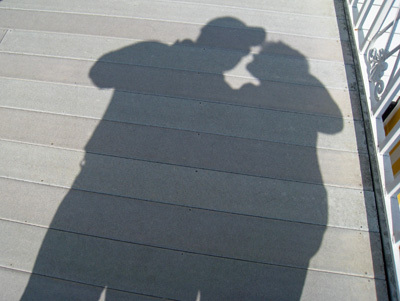 Your Shadow - Here I am standing with Robbie on the balcony that was often seen in the TV show Dallas (most noticeably when Kristen was pushed to her death & when JR & John Ross dove off it during the house fire). 2. 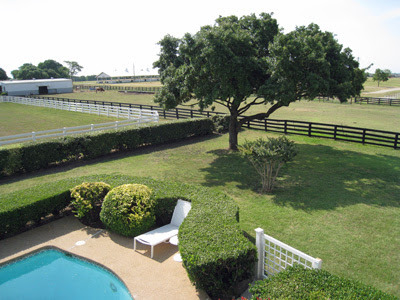 A Tree - Here's a view looking out from that same balcony with a nice shade tree in the center and a little bit of the pool visible. The pool is actually much smaller than it looked on TV - they used wide angle lenses and placed mirrors in the pool to make it appear larger. 3. 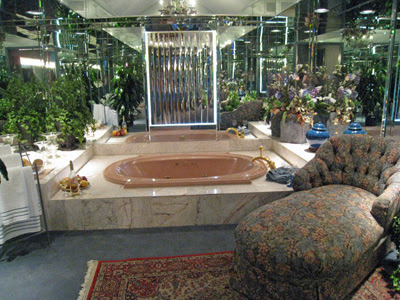 Golden Light - This ranch was only used for filming exterior scenes during the show Dallas, however, now that it is a tourist attraction, the interior has been decorated to reflect the lifestyle of the Ewings. 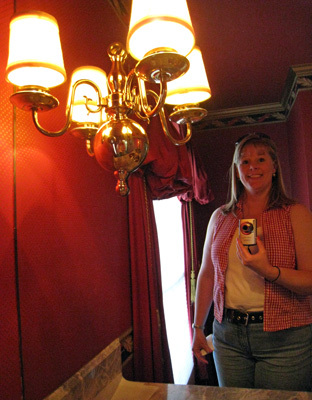 I found this golden light in one of the powder rooms. 4. Growing - These pretty flowers are growing near the pool area outside. 5. 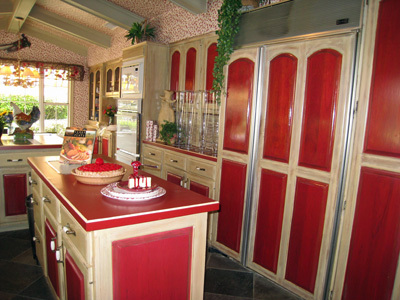 Something red - The kitchen is decorated in a brilliant red hue. 6. 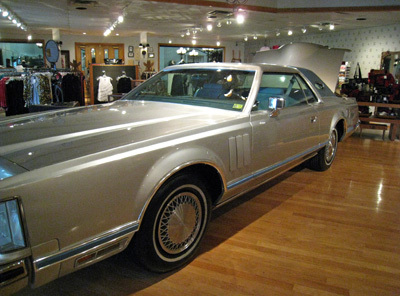 Something big - Jock Ewing's 1978 Lincoln Continental is on display in the Lincolns and Longhorn apparel store. 7. Supplies - Each bedroom inside the ranch house is decorated to reflect one of the Ewing characters (JR, Bobby, Miss Ellie & Jock, Lucy). This lovely tub room is off JR's suite and contains all the important supplies for a luxury bath - towels, soaps, drinks, fruit, etc. 8. Directions - We were careful to follow these directions while strolling around the grounds to see the miniature horses, Longhorn cattle, and saddle horses. 9. 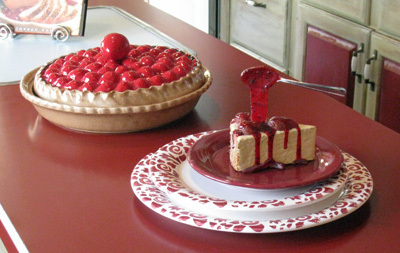 Delicious - Even though these are fake desserts, they certainly look delicious! 10. Done - Here's the sign we saw when we were done with our tour. 11. 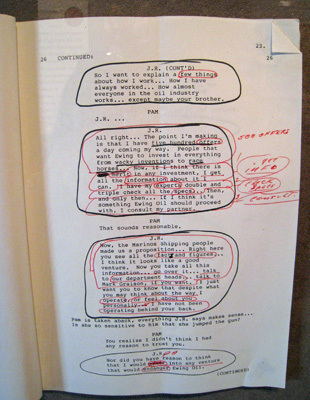 Important - There were several of Larry Hagman's scripts on display in the museum. I enjoyed seeing how he highlighted and made notes of important sections. 12. 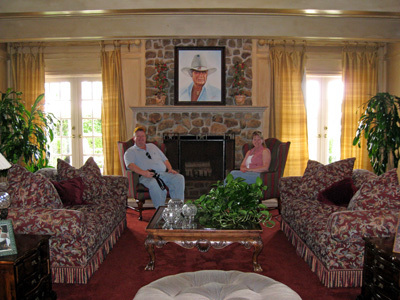 Exciting - We toured the ranch on a very slow Monday morning, so the tour guide moved the ropes to the living room so we could get this shot of me & Robbie sitting near the fireplace. 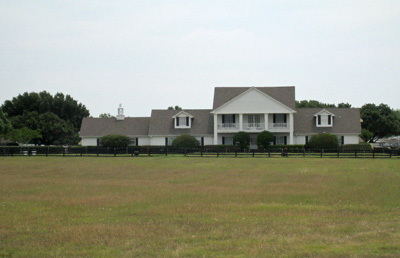 The cast was filmed here 13 years after the series ended for the Dallas:Return to Southfork reunion. BONUS - a neat crafty idea I discovered while we were there. 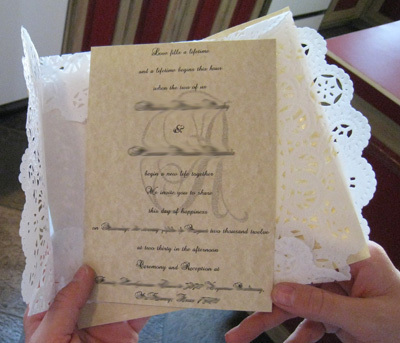 Our tour guide was working on her wedding invitations, creating them herself, and she showed me how she was wrapping them in white paper doilies which she was then going to tie with twine. Of course, we took a ton more photos on our tour. Let me know if you're interested in seeing some of the other rooms in the house and I'll post some of those in the next week or so after I've processed the remaining photos. We're currently counting down to June 13 when the new Dallas TV series begins. 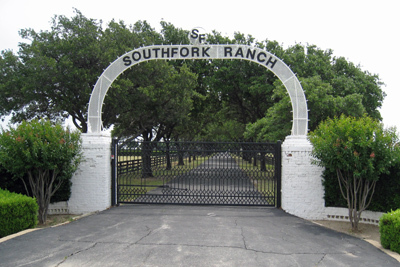 The cast was here at Southfork filming earlier this year, so it will be fun to watch for some of the places we just visited to appear in the episodes. 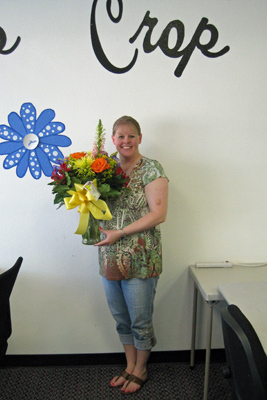 I was surprised and honored to read Alison's post last week awarding me the Liebster Blog Award! And I can totally relate when she writes about how difficult it is to pass on these awards because there are so many fabulous blogs out there these days. The goal of this award is to bring attention to blogs with less than 200 followers. Rather than try to choose five blogs to pass this award on to, I try to highlight inspiring blogs by linking to them and giving credit for the inspiration I receive in blogland. 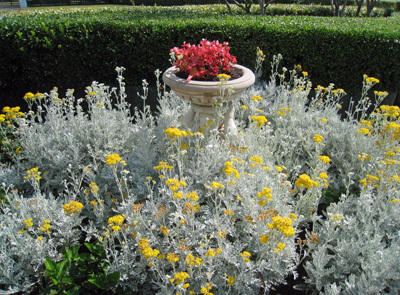 Be sure to watch for those links & click on over for inspiring ideas! Here's a little something crafty inspired by the latest LOM Community challenges to scrap about friends. 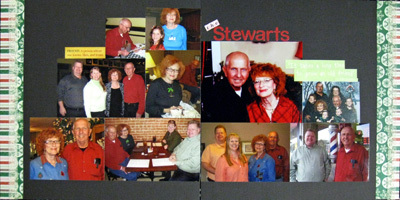 I combined photos from various get-togethers over the past four years of our dear friends the Stewarts. I added a couple of quote stickers and patterned paper strips and am very pleased with how it turned out. FRIEND: A person whom one knows, likes and trusts. When I started putting together page kits to take to Corsicana last week, I spread out my printouts of sketches from the BPC 28 Sketches workshop for inspiration. I separated the sketches by number of photos, then flipped through my storage binders for pictures that I was inspired to scrap. 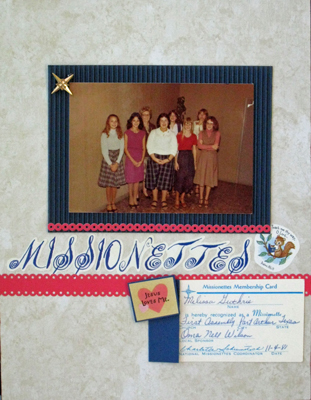 I matched the photos with a sketch, then pulled some papers & embellishments to create a kit. It took a good bit of time to put the kits together, but it was well worth the effort so I could crop and visit and snack all at the same time! I had previously used Sketch #3 on my Curb Your Enthusiasm layout, but it worked perfectly for this photo of the twins during their visit here last summer. I used the last sketch (#28) for these photos from December of 1993 when I was volunteering as Youth Director at my church. 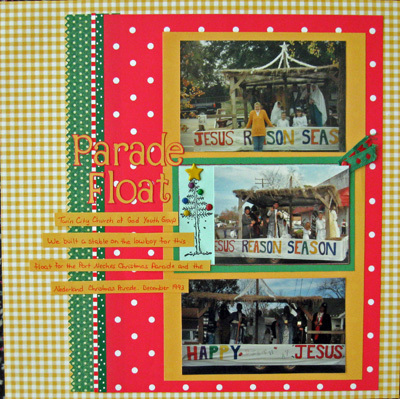 We built a stable on a lowboy trailer for two Christmas parades that year - and won an award in one of the parades! I'm excited to get some of my older photos and stories as well as some newer ones scrapped with these sketches. ﻿Have you scrapped any older photos lately? I mentioned in yesterday's post that there is a way that you can help us win a half-priced retreat to Scrappin' Goodtime in Corsicana, Texas. "Us" is simply the group of BPC students that got together last week to meet in real life and crop together. Six of us participated, but if we win the contest we will be able to host a retreat for 14 croppers! I'm pretty sure I can find a time to fit in another retreat this year. Basically all we have to do to win this competition is have the most comments AND likes on our group photo that's posted on the Scrappin' Goodtime Facebook page. The ladies at the store/retreat center didn't really understand how online classes and blogs worked or how we had so many friends online. We, of course, were bragging/boasting about how great the classes and students and teachers at BPC are and how we were sure we could win this contest just because there are so many of us in each class and how we have lots of online friends through our blogs. Now here's where you come in. If you have a Facebook account, PLEASE jump over & leave a comment AND like our photo. We certainly don't want all ourTexas sized bragging to go to waste! :>) And we want to support this great LSS & retreat! Click here to comment AND like our photo and help us win! Speaking of planning another retreat makes me want to thumb through my calendar & check available dates, which reminds me of this layout I created that documents a yearly ritual. Journaling reads: Despite the fact that we live in an increasingly digital society, I still love a paper calendar and the ritual of setting it up every year. 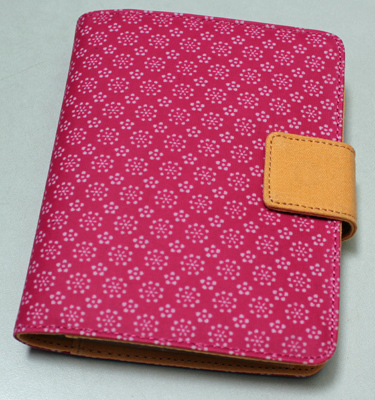 It's color-coded and keeps me organized and on time very day! Thanks in advance for your help in the retreat contest. I'll let you know if when we win in case you want to join us! Have you missed me? I really haven't gone missing; the last couple of weeks have been busy with lots of fun activities that have kept me away from the computer. Here's a little peek into what I've been up to and what you can expect to see coming up on my blog. The Ladies' Ministry at our church hosted a Spring Brunch & Agora (marketplace), and since I am on the Ladies' Ministry Leadership Team I had lots of fun helping with all aspects of the event from planning to clean-up. 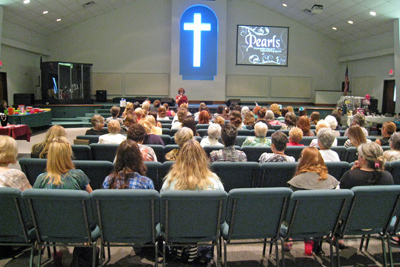 We had over 100 ladies in attendance at the event. 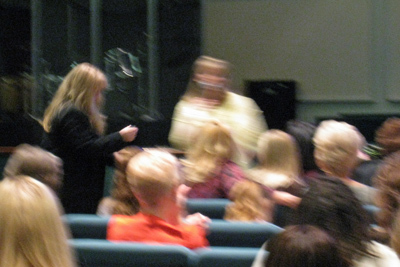 I emceed the event, keeping things running (somewhat) smoothly and giving out over 30 door prizes. I did hand off my camera a few times hoping to get a few shots of me at the event, however I either have a goofy look on my face or was moving too fast for the camera. 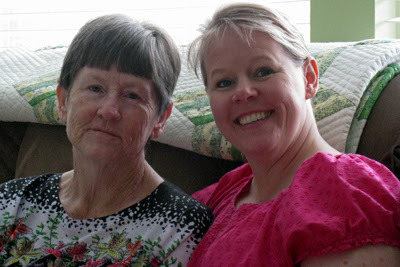 Then we had my parents over for lunch & an afternoon of playing games to celebrate Mother's Day. Robbie, as usual, had flowers delivered to the retreat center before I arrived - his way of reminding me to have a good time when we're apart! 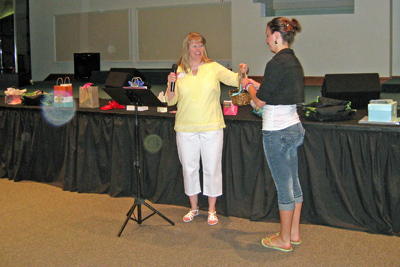 We had a fantastic time at the retreat - lots of creating, laughing, snacking, shopping, sharing ideas, creating, snacking. . . I have 10 new layouts to share with you in future posts. Right before I left for my scrapping fun, Robbie's lifelong friend arrived for his first visit to Texas. They visited a museum, took in a movie, and attended the Dallas Comic Con while I was away. Then the three of us went to an antique trade days . . . and they were just like kids again checking out all the toys & things! 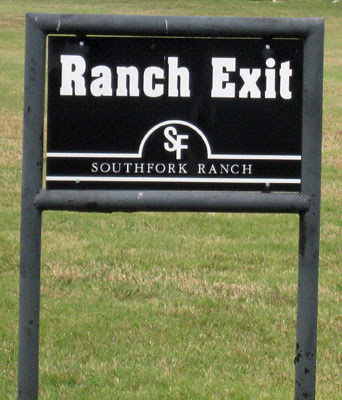 We spent a morning at Southfork Ranch (yes, THE Southfork Ranch from the 1980s Dallas TV show and the upcoming new Dallas show that premiers June 13). I took the Twelve Photos prompts for May with me and will be sharing my twelve photos (or maybe a few more) in an upcoming blog post. Now you can see why I haven't been around much! Thanks so much to those of you who emailed to be sure all was ok here in Texas! I'm looking forward to sharing more of these good times with you in upcoming posts (I'll also be posting to pass this month's book before the end of the week) and will be around to see what y'all have been up to as I catch up over the next few days. BTW - I did have a guest post on the Camerons in Kenya blog earlier this month - you can check it out here. 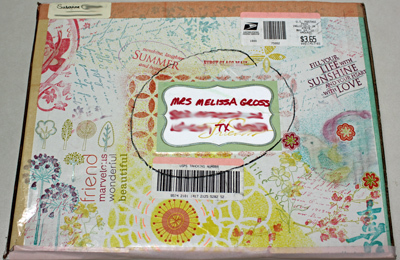 Look what I received last week as part of Ginger's Mail Art Exchange. 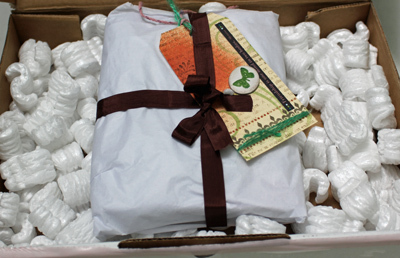 This lovely box from Susanne of Snaps & Snippets totally made my day. Susanne claims to have forgotten that the theme of this swap was "Words", however I think she did a lovely job using so many quotes & script-themed stamps on this package. I was so excited to see what was inside that I almost forgot to snap a photo before I opened it! Inside I found this cute package & tag. I opened the package to reveal this happy photo album. Y'all know how much I enjoy creating Photo Album Scrapbooks, so this was a perfect gift. 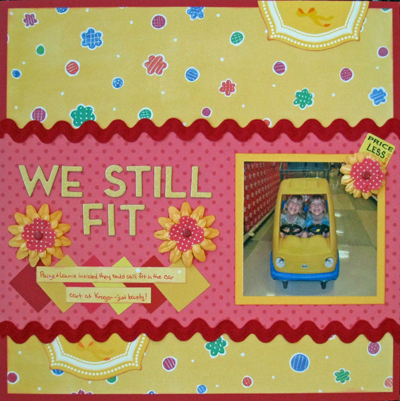 But even better than the photo album itself was the fact that it was pre-filled by Susanne with pretty 4x6 patterned papers and embellishments!! I'm certain you'll see this little album featured again with photos over the summer. In fact, I think I need to plan a fun weekend trip right now so I'll have the perfect photos to fill it. What do you think? In between challenges throughout Shimelle's Scrapbooking Weekend several weeks ago, she posted 10 questions for us to answer in the comments, so I thought I'd group those questions together and share my answers today (with a little more detail & a photo or two). 1. 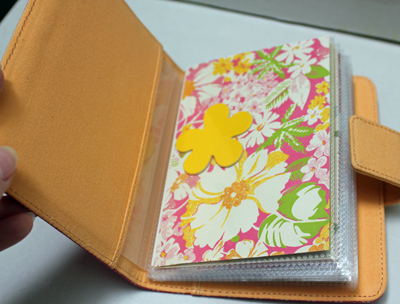 How do you store your thickers and other letter stickers? 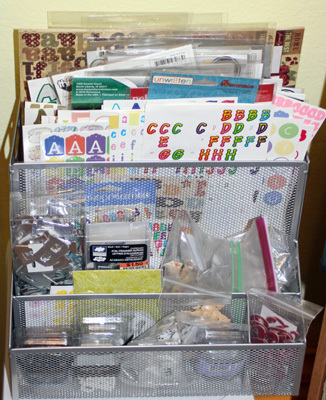 I have all my thickers/letter stickers together in one upright bin (no lid), sorted by color. This makes it easy for me to flip through them to find what I want to use on any given layout. 2. Where to you find inspiration? I often find inspiration when we are browsing at flea markets & antique shops. I get ideas for layouts and find little bits & pieces that I think will be perfect for a page & I snap photos of fun craft project ideas. 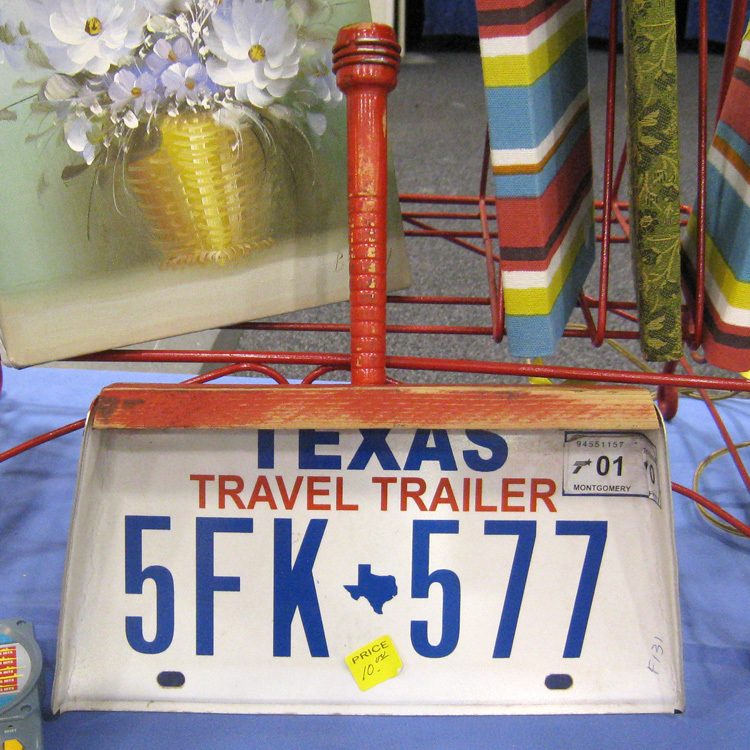 We have a couple of flea markets/trade days that we visit each month, which keeps the inspiration flowing. 3. How do you use tape in your crafting projects? Honestly, I haven't used a lot of tape. I have a few rolls of kraft travel themed tape that I used in Robbie's Florida Trip Photo Album Scrapbook & I received some lace tape for a Christmas gift (maybe it's time to pull that out & use it!). 4. How do you deal with imperfect digital photos? In the past year I’ve used PSE to edit some photos, however if it’s a photo I want to scrap to record a memory I print it and use it anyway. Photos, like life, are not always perfect, so I just go with it (especially when there’s not another photo from that event/day/moment). 5. 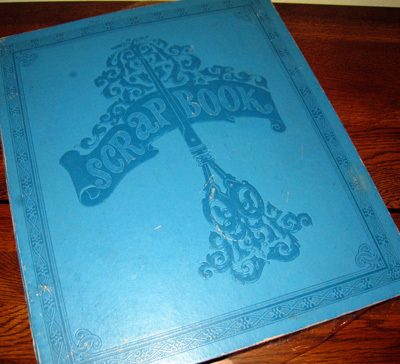 How did you start scrapbooking? My Mama started a scrapbook for me when I was born and sometime during elementary school I took over adding items to it, so really I've scrapbooked most of my life! In fact, I am working on a series of posts about my life as a scrapbooker. 6. 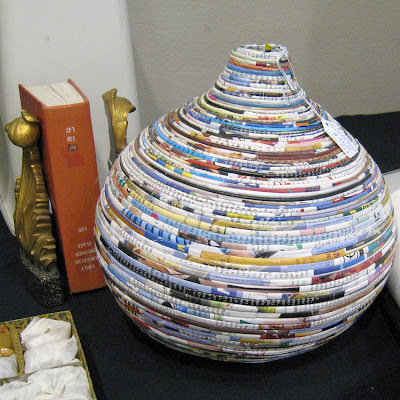 How do you store your scraps & off-cuts? I sort my scraps by color & store in page protectors right beside the chair I sit in while I craft. I blogged about it here. 7. 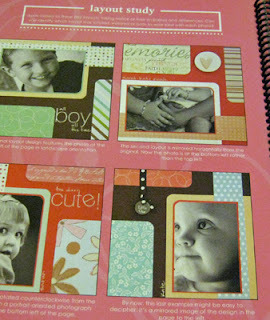 How do you make a scrapbooking page kit? 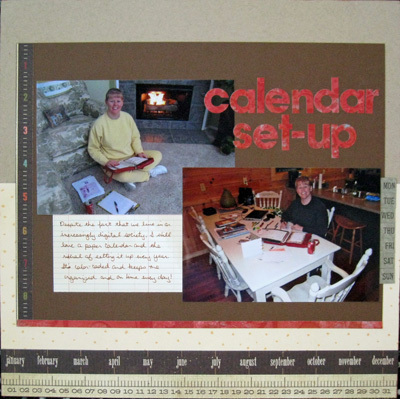 I use page kits only when I'm cropping away from home which was not often until this year when I started planning more get-togethers with friends. I always start with my photos, then pull a couple of full sheets of cardstock or patterned paper that could be used for the background and matting. I add letter stickers and a few embellishments. Just like Shimelle: I err on the side of too much paper rather than not enough. I keep each kit in a page protector in a 12x12 file box. I take my scrap file with me as well as tools, flowers & brads, so I can add bits of other papers & handmade embellishments. I am currently in the process of creating some page kits for a crop coming up May 17-19 where I will meet several other BPC students for the first time in real lift. 8. 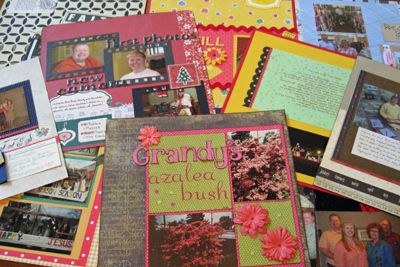 How do you create a scrapbook page from start to finish? (Bonus points if your process includes supplies speaking to you!) 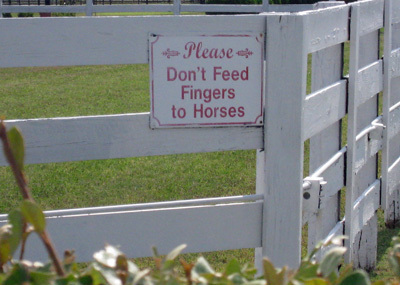 Oh my goodness, are there times when supplies don't speak to us? LOL I pull my photos, choose a background paper & other coordinating papers, choose a design (sketch, scraplift, or my own thing), create journaling on a separate piece or decide to write right on the layout, then I arrange all these elements & begin pulling and adding embellishments. 9. 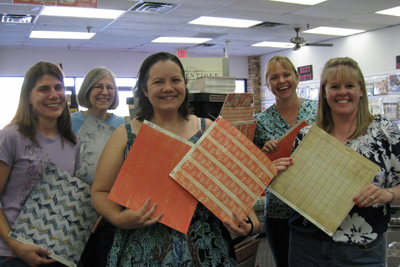 How do you sort your scrapbooking papers? I sort my papers by color and store them in plastic drawers. For each color, I have solid cardstocks on the bottom, solid papers, then patterned papers from light (top of stack) to dark. When I'm ready to scrap, I pull out the color I want and thumb through the stack. I do have one small expandable file that holds my few themed papers, also. 10. 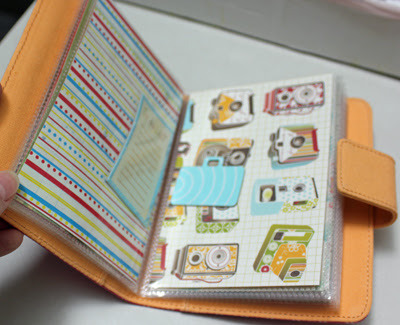 Where do you scrapbook? 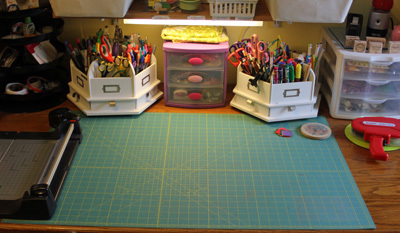 I scrap most of the time in my office/craft room, sitting at my craft table. When I have friends over to crop, we scrap on the dining room table (with all the added leaves in it! ).